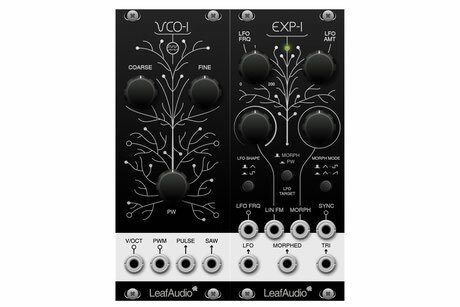 / VCO-1 - leaf-audios Webseite! VCO-1 is an good sounding analogue VCO (oscillator) for the modular Eurorack system. It can be complemented by the EXP-1 (VCO expander module), which adds many functions like sync, lin. FM, wave morphing, LFO with internal routung possibilities etc. VCO-1 is temperature stable and provides a clean 1V/oct tracking over minimum 4 octaves. DIY level: Medium. The VCO-1 DIY kit can be built by medium experienced DIYers in about 2-4h. After finishing it, the 1V/oct tracking has to be adjusted, what might need some experience. Building Instructions for the DIY kit can be downloaded here. Availability: Besides our workshops, VCO-1 is available via our online shop Exploding Shed. 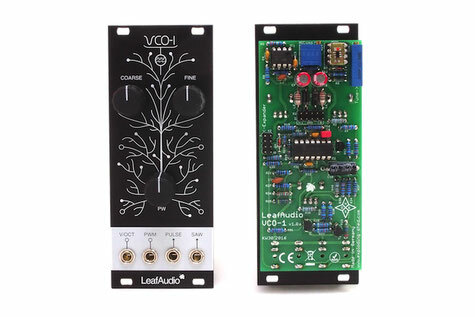 Powersupply: Like all Eurorack modules, the VCO-1 is powered by a symmetrical power of +/-12V. It has a current draw of 25mA at +12V / 20mA at -12V. Additional Info: Unlike most DIY manufacturers, we produce our panels and circuit boards in germany. We also only use quality materials and durable parts. We hope that our customers appreciate and support that. The frontpanel was designed by Hannes Pasqualini / Papernoise. The VCO was developed for us by Leshracs Lab.